"We secretly believe God has made many mistakes and failed to show up many times." The word ‘new’ is Kainos. It denotes new, of that which is unaccustomed or unused, not new in time (recent), but new as to form or quality, of a different nature from what is contrasted as old (from Vine’s Expository Dictionary). The NEW, toward which God is inexorably moving, is to bring all things into what has never been, that which is utterly of a different essence. 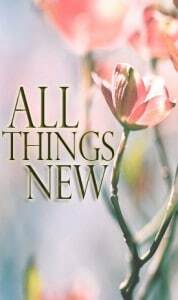 The coming new is a “fresh” bursting of something not like anything of the past, nor having any resemblance to the old.